H.E. Carlos Moreno, the recently installed Ambassador of the US to Belize, hosted a media roundtable at the US Embassy in Belmopan this morning. During that session, Moreno answered questions from the media on a range of topics, including the role of the US in helping Belize protect its territory from illegal incursions by Guatemalans, the threat of an Ebola outbreak in the Americas after the US flew home two patients with the deadly communicable virus for treatment this month, and bilateral efforts to help stave off the wave of violent crimes in Belize. With that said, we asked the Ambassador to clarify the position on the border between Belize and Guatemala, as defined in the Belize Constitution, and he told us that while the US cannot take a position for either Belize or Guatemala, the US does support the call for the territorial differendum to be taken to the International Court of Justice. We also asked the Ambassador questions about his stance on homosexuality and gay marriage. Moreno said that LGBT rights are a subset of rights that are accorded to everyone. He confirmed that the US Government had given grants to the LGBT activist group in Belize, UNIBAM. In our questions submitted a week before this morning’s roundtable, based on a request from the Embassy, we asked the Embassy to indicate exactly how much funds had been granted to UNIBAM; however, when we posed that question at this morning’s roundtable, the Ambassador told us that he did not have the information. 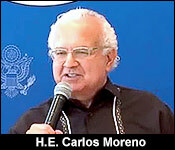 “There is no LGBT agenda by the US Government,” Moreno told the media. Last night we told you about the media roundtable with the US Ambassador. It happened at the Embassy in Belmopan, and we weren't allowed to take any cameras or recording instruments into the session. But the embassy taped it - and said they would provide video yesterday - but like an electronic passenger stranded without a broadband visa, it didn't arrive until today. The sessions lasted about an hour and 10 minutes, and one of the most interesting takeaways were his comments on Cayo Northeast Representative Elvin Penner. Here's what we asked and what he said - again, video courtesy the US Embassy. "Will Elvin Penner's VISA be revoked?" "I can't comment on individual cases. That question is probably be directed to Minister Penner or Mr. Penner himself as to whether his VISA has been revoked. As to any efforts by the US Embassy to revoke his VISA since that's a matter - it really raises questions of privacy and the institution and workings of the counselor section. I should not really comment on that." "Let me add, I think that the integrity of the process whether it's in the issuance of the passport or VISA - any kind of official document that has the of a government official should be scrutinize carefully, should be treated very seriously the government in question. I say that because countries rely heavily on the authenticity and the integrity of documents that are presented to us when that traveler comes to another country and if we don't have that essential element of rule of law with respect of the integrity of these documents then I think we are in serious trouble." Adele Ramos from the Amandala also asked the ambassador about deportation of gang members from the United States to Belize - which, it is believed, gave rise to the Bloods and Crips gangs in Belize City in the 1980's - and City gangs are still divided along those red and blue lines. Moreno had an interesting perspective because he is a former trial judge in Los Angeles who has dealt with many cases involving gang members. But he said the problem of gang violence is not one caused by the United states:..
"The deportation of those individuals who were deported from the United States to these countries that I've mentioned is a serious question. I don't think that the United States bears the brunt of responsibility for that people are responsible for their own actions in the first instances. But I think that you've raise a valid point and I think when you look at the roots of why we are having this migration of children and families, not so much from Belize, but the other 3 countries I've mentioned. While that is attributable to the gang and violent crimes in those countries. I think yes, the United States has a degree of responsibility to address those root causes of violence in those countries whether it's from deportees or other people - if you want to seriously address this question of migration of children." Of course, the main root cause the ambassador didn't discuss is the smuggling of drugs from South America to the United States through Central America, which is what empowers gangs with weapons and financial resources.